When I started blogging three years ago, I went looking for community, and the RevGalBlogPals were the first group to take me in. 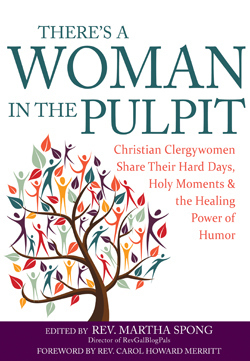 At that time, the original group of about a dozen clergywomen had grown to a ring of 450 blogs, now the Facebook group is 2500+ members, and some of the RevGals have just published There’s a Woman in the Pulpit: Christian Clergywomen Share Their Hard Days, Holy Moments and the Healing Power of Humor (Skylight Paths Publishing, 2015). to wonder what to wear on a Sunday morning in the pulpit. Like other ordained persons in general, I and the other RevGals have pondered our ministry while driving or washing dishes, have cut short or changed vacation plans due to a death in the congregation, and share many other experiences. Yet as clergywomen we are each also utterly unique. I don’t wear four-inch red heels, haven’t joined a trivia team at my local pub, don’t teach water aerobics or write romance novels on the side. Ordained women are as different from one another as any two churches might be, as any two people might be. There’s a Woman in the Pulpit reminds me of that too. In this book, each story or prayer is just two or three pages, perfect for dipping into here and there. Yet reading straight through as I did for most of the book, I couldn’t help but wonder, for all of the diversity in age, marital status, and church practice, where is the diversity of ethnicity and culture? Perhaps that could be a growing edge for the RevGals and a future project. From the beginning, we determined that, despite differences of theology, practice, and life circumstances, our belief that God calls women to ordained ministry is the common ground on which we stand. For this reason, you will not find theological arguments in this book. . . .
Be fierce and fabulous for Jesus. The Internet, Facebook, blogs, Twitter–they are not monoliths of anonymous power. They are potential bridges of hope, healing, and hospitality. Why does the church look bigger when we are standing? Why does the church look bigger when we are standing? . . . . It is one of my jobs to think about it. Maybe it’s this: When we stand up, we are not just a collection of individuals. When we stand up, we are a choir, a work crew, a family. We are a team of mountain climbers, a band of wandering disciples. People of God, no matter how small you are, you are bigger when you are standing up, together. Thank you, RevGals, for taking me in, and for There’s a Woman in the Pulpit. I wish all of us many more sacred moments of ordinary and extra-ordinary ministry, fierce and fabulous for Jesus. If you’re a woman in ministry, know that you can be fierce and fabulous for Jesus! If you know a clergywoman, share this article with her, and bless her ministry. If you like this article, sign up for my updates, and you’ll also receive a link to download your free copy of the Sacred Pauses Group Leader’s Guide and Scripture Index. Thanks, April. Sounds like a book we should have at CommonWord – I’ve put in my order :). hmmm, the book isn’t particularly Anabaptist, so the theology and church practice are quite different from Mennonite Church Canada, and some may find it too “progressive,” even controversial, since it reflects a spectrum of women in ministry across denominations. I’m not planning to put a copy in our own church library since I think we need to focus on more specifically Anabaptist resources, but for discerning readers, the book does offer a unique window on women in ministry that I can appreciate. I love reading your book reviews. Do you ever lend out these books because I would like to read this book and the crowdsharing one.